Victor Stone realizing that he’s not entirely human anymore. While Young Justice: Outsiders is building toward a larger plot involving metahuman trafficking and an impending war between Earth and Apokolips, the show’s also incorporating an astonishing amount of classic DC characters into its plot to keep things interesting and somewhat difficult to predict. And one of its latest is tying into it all. The show’s core team of heroes was already pretty expansive—including members of Young Justice proper and the Justice League—but this season’s spent a fair amount of time following as newcomers like Geo-Force, Halo, and Forager come into their own as fledgling crimefighters. 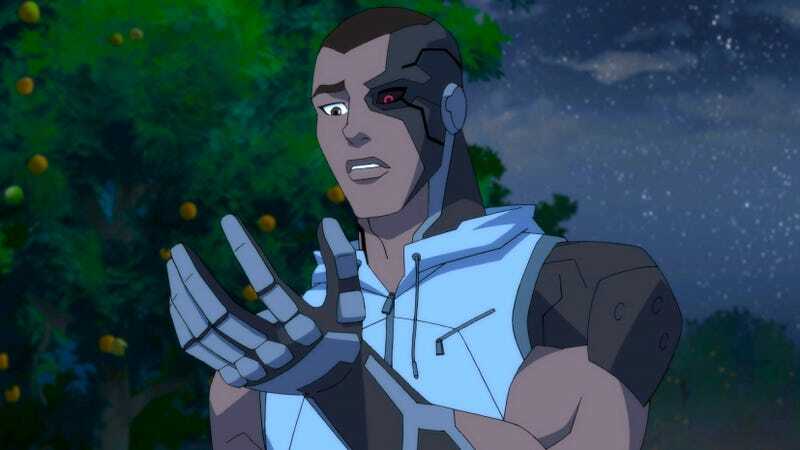 But just as it seemed as if the trio of newbies were finally established enough to be considered ready for the big leagues and Young Justice was preparing to move past the getting-to-know-you segments of their stories, the series shifted again this past weekend by bringing Cyborg into the mix. Unlike most of his other more recent appearances on series like Teen Titans Go! and Doom Patrol, where he’s already an established hero working alongside the likes of the Justice League, Young Justice: Outsiders introduces us to a much younger Victor Stone who still has aspirations of playing college football. Though Vic’s a star player for his high school team with plenty of prospects from universities looking to recruit him, he struggles with feelings of inadequacy because of his unhealthy relationship with his father, Dr. Silas Stone. To Silas, Vic’s athletic prowess is a reminder of how different their interests are, and how much more concerned he is with his research into alien technology. Like in DC’s comics, Vic and Silas love one another, but they’re at a point in their lives where it’s difficult for them to connect, something they both come to regret after a freak accident in Silas’ lab leaves Vic severely wounded and on the brink of death. Most modern tellings of Cyborg’s origins involve his technological components coming from his body fusing with a Motherbox, a powerful, living piece of New Genesis technology capable of many incredible feats like opening boom tube portals. Young Justice changes things a little bit by having Silas choose to allow a Fatherbox, the Apokoliptan answer to a Motherbox, to bond with Vic instead. Slight as this change to Cyborg’s origins initially seems, it has a larger significance as Young Justice plays out. Cyborg seeing through his new interface for the first time. Because Apokoliptan Fatherboxes are, well, evil (see: Darkseid and his penchant for villainy), Vic’s metamorphosis into Cyborg has a decidedly insidious overtone to it, complete with a truly horrific transformation sequence that feels like a techno-organic answer to The Fly. When Cyborg awakes, fully healed, and newly empowered, the Fatherbox is in control more than Vic is and his core programming is seemingly focused only on killing and rage. A Very Special Episode™ about Team Young Justice tracking Cyborg down and containing him before convincing him to join the team would be a very traditional plot line for this kind of cape show, but the recent episode “Freaks” goes the slightly more complicated route in order to do some interesting world building. Over the course of the season, Young Justice has gradually revealed more and more information about Halo’s past life and the strange nature of her outsized metahuman powers. Where most metahumans typically only exhibit a limited set of super abilities, each of Halo’s differently colored auras manifests a completely new set of skills and, much to the continued shock of everyone around her, one of those skills appears to be near-immortality. No matter how many times Halo’s been mortally wounded (too many, to be honest), she’s always able to immediately resurrect herself and has shown that she can similarly heal others. While Cyborg is raging in his father’s lab and coming very close to killing a bunch of people, Halo—who is hundreds of miles away—discovers yet another ability she can’t quite yet control: summoning boom tubes. As fate would have it, Halo’s first tube brings her face to face with Cyborg, who she’s able to “cleanse” of the Fatherbox’s influence. Halo wielding her violet aura. In DC’s comics the original Halo was a woman named Violet Harper whose body was possessed by the disembodied essence of an alien after Violet’s spirit passed away. The sheer shock of the alien being drawn to Violet, and Violet’s body reeling from its death, causes the “new” Violet to retain little memory of her past life, and so she begins to forge a new identity as a superhero fighting alongside the Outsiders. “Freaks” spells out how Young Justice borrows from pieces of Halo’s comics origins, while also cleverly weaving them into its own unique plot. Like her comics self, “Violet” (as she’s now calling herself) came to be as a result of a human woman’s body becoming possessed by the soul of an alien, and their fusion causing the new being to experience profound amnesia, but in this instance, the alien is actually a Motherbox. Sensing the presence of a malevolent Fatherbox on Earth brings out the power in Halo that’s tied to the Motherbox that creating her, and as she and Cyborg come together, you can see even more hints about the ultimate conflict Young Justice: Outsiders is building towards taking shape. In time, Earth’s heroes are going to have to rally together to face Darkseid as he attempts to wage war against Earth with all the might of Apokolips, and now the Justice League (in a roundabout way) has access to two people with direct connections to the kinds of technology that could ultimately decide how things play out. It’s an interesting way to elevate both Cyborg and Halo to positions of prominence within Young Justice’s mythos, and it promises that the pair are in for plenty more action by the time the season’s over.